UN Secretary-General Ban Ki-moon addressed the Denver Forum, a public forum on democracy in Denver, Colorado, US, sharing his latest views and plans for climate change negotiations and the post-2015 development agenda. 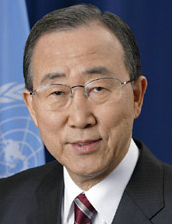 7 June 2013: UN Secretary-General Ban Ki-moon addressed the Denver Forum, a public forum on democracy in Denver, Colorado, US, sharing his latest views and plans for climate change negotiations and the post-2015 development agenda. He also addressed sustainable development, which he said does not mean only cutting pollution and preserving ecosystems, but also fairness and opportunity. In this regard he highlighted access to electricity and the Sustainable Energy for All (SE4ALL) initiative. Ban said, “sustainable development must be at the core of a global strategy for the coming years that builds on the success of the Millennium Development Goals” (MDGs).